Governor Andrew M. Cuomo today signed legislation to increase protections for immigrant children who have been separated from their families as a result of the Trump Administration's inhumane "zero tolerance" policy. The legislation will provide parents who have been detained in New York, or are facing deportation from the state, an opportunity to appoint someone of their choosing to step into their shoes and provide emergency care for their child. "The Trump Administration's heartless treatment of immigrant children violates equal protections and leaves an ugly stain on our country's history," Governor Cuomo said. "By taking action today, these new protections send a message loudly and clearly that New York will never abandon the values that have long sustained and nourished this state and nation, and we will do everything in our power to protect the health and well-being of these innocent children." "As the humanitarian crisis on our border continues, New York is once again helping families who are suffering at the hands of a hostile federal government," said Lieutenant Governor Kathy Hochul, who attended today's event. "With this legislation, immigrant parents facing possible deportation from New York can choose a guardian who they know and trust to care for their children. With hundreds of children being placed in facilities in New York and struggling with the trauma of being separated from their families, this is an important step forward. We will continue to fight back against the Trump administration's inhumane immigration policies and ensure immigrants' rights and freedoms are protected." As a result of harmful federal policies and in the event of sudden detention or deportation from New York State, parents whose children reside in New York State are in need of preparedness options to plan for the emergency care and control of their children. Currently, a parent in New York can only designate a standby guardian for their child in the event of their (i) incapacity, (ii) debilitation and consent, or (iii) death. The bill (A.7899/S.6217), which the Governor signed today, will immediately allow for a standby guardian's authority to kick in when and if a child - documented or undocumented - is separated from a parent. The legislation also grants the court the ability to appoint an attorney for the child to then recommend whether the appointment of a standby guardian is in the best interest of the child. As authorized under the current General Obligations Law, parental designation forms provide a mechanism for parents to make arrangements in advance and for a caregiver to be designated without going to court. This law allows this arrangement to last for up to six months. The second bill signed by the Governor today, (A.7905/S.6016) immediately amends this law to extend the time period to 12 months in which someone can serve in this capacity. New York will never abandon the values that have long sustained and nourished this state and nation, and we will do everything in our power to protect the health and well-being of these innocent children. Senator Diane Savino said, "New York is fed up with the harmful, cruel policies this federal government has oppressed on our nation. 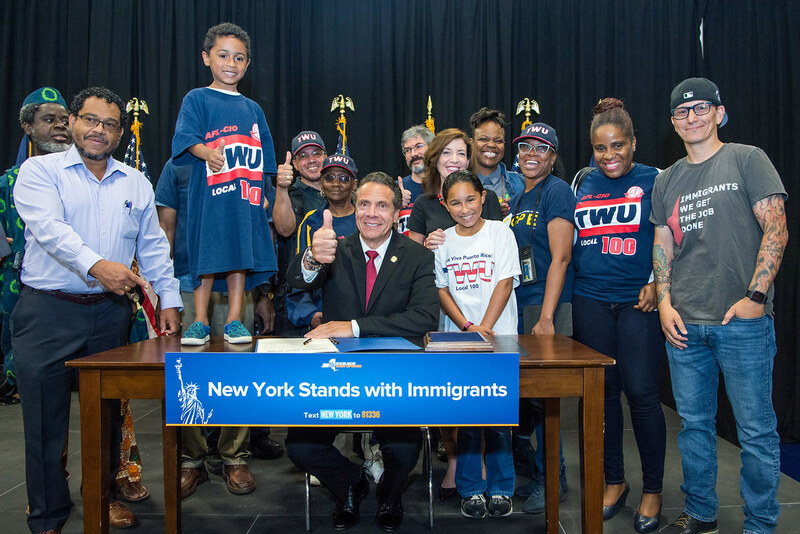 Under the leadership of Governor Cuomo, we will continue to fight back and strengthen protections for our New Americans, including their children, who are blameless and have been caught in the crossfire of catty politics. The signing of this legislation today will help ensure these children are taken care of by someone their parents trust." Assembly Member Nily Rozic said, "New York's history of welcoming and protecting immigrants is defined by a new milestone with the signing of this legislation that will help keep families together through standby guardian arrangements. I am proud to have sponsored this bill with Senator Savino, and thank Governor Cuomo for his quick action and leadership to make these protections a reality for the many families who have long called New York home. While much more work remains ahead, this new law will serve as a necessary tool for parents to ensure their children's care and safety." Senator Tony Avella said, "I am proud to the support Governor Cuomo's continued efforts to fight for the rights of immigrants in New York. This latest action will secure parents' ability to appoint guardians to watch over their children in the case of an emergency, and for an extended amount of time - up to 12 months. This will allow even more time for parents to overcome our federal government's asinine policies, find their footing, and reunite with their families." Assembly Member Ellen Jaffee said, "Our diverse communities are thriving thanks to our ancestors who traveled here from around the world to establish the great state of New York, and we will not turn our backs on New Americans coming to this country to do the same for their families today. I applaud Governor Cuomo for signing legislation that makes sure immigrant children will have a guardian to take care of them if their parents are suddenly held in detention or deported." This latest action builds on the state's comprehensive efforts to challenge the federal government's callous "zero tolerance" policy and protect immigrant children. The Governor, along with State Attorney General Underwood announced a multistate lawsuit with 18 other states to challenge the policy. Following Governor Cuomo's pledge on June 19 to file the suit, New York joined the multistate lawsuit which was filed by the Attorneys General of Washington, Massachusetts, California, Maryland, Oregon, New Mexico, Pennsylvania, New Jersey, Iowa, Illinois, Minnesota, Rhode Island, Virginia, Vermont, North Carolina, Delaware and the District of Columbia. Dispatch personnel, resources and services to foster care providers that are caring for these children, including medical supplies. Provide services for immigrant children discharged from facilities to family members, including education, mental health and health care services. Provide the same support to children being released to private foster care providers in New York, including from other states. Demand HHS release information about all unaccompanied immigrant children in New York State, including those who were first sent from the border to other states before being placed in New York. Take actions to support family reunification, including working with counsel generals at facilities to provide immediate support. Provide resources and protection to bolster public safety at facilities caring for immigrant children. In the wake of the Trump Administration's travel ban, Governor Cuomo launched the Office of New Americans Hotline, a toll-free, multi-lingual hotline that provides live assistance in more than 200 languages. Individuals seeking immigration assistance can call 1-800-566-7636 for free legal services through the Liberty Defense Project. Anyone can call the hotline for information and referrals, regardless of citizenship or documented status. Calls to the hotline are confidential and anonymous. The hotline operates from 9 a.m.to 8 p.m. (ET), Monday through Friday (excluding Federal holidays) and is managed by Catholic Charities Community Services.